Home Politics EXCERPTS FROM A WORLD PRESS CONFERENCE ON STATE OF THE NATION BY “THE CHAIRMAN OF TECHNICAL COMMITTEE FOR ATIKU PRESIDENTIAL CAMPAIGN ORGANIZATION”. EXCERPTS FROM A WORLD PRESS CONFERENCE ON STATE OF THE NATION BY “THE CHAIRMAN OF TECHNICAL COMMITTEE FOR ATIKU PRESIDENTIAL CAMPAIGN ORGANIZATION”. Gentlemen of the Press. Great Nigerian Youths and Fellow Nigerians, I welcome you all to this press conference to express our concerns on state of the Nation under Buhari/APC government especially as the general elections draw near. As the general elections draw near, we deem it very important to review the state of the country and address Nigerians and international community on germane issues of concern. We are concerned that the Buhari/APC government in Nigeria has fully spiraled into fascism with the recent illegal and unconstitutional (prosecution) of the Chief Justice of Nigeria aimed at hijacking and controlling the Judiciary, the last hope of ordinary Nigerians and the bastion of democracy. This is a matter of grave concern to Nigerians especially coming after brazen attempts by Buhari/APC government to use politically-directed security agencies to effect leadership change of the national assembly and foist a rubber-stamp legislature on Nigerians. While calling for immediate discontinuance of the illegal prosecution of the CJN and recourse to due process and rule of law, we call on all well-meaning Nigerians to denounce and resist all attempts by the Buhari/APC government to undermine or truncate our hard-earned democracy by the hijacking and controlling the Judiciary. We are also concerned about misgovernance of Buhari/APC government has inflicted on Nigerians with an alarmingly high rate of poverty and hardship for which Nigeria is ingloriously rated globally as the Poverty Capital of the World with an unfortunate heap of socio-economic woes is being wickedly piled up for the incoming government and future generations. We therefore make a clarion call on all eligible voters to rise for redemption of our country at the forth coming general elections by voting out this current inept and clueless government of APC. Recall that the Independent National Electoral Commission (INEC) has become immorally aligned with the Buhari/APC ruling party as evident in appointment of Amina Zakari as head of Presidential election collation center despite being a blood relation of President Buhari and the lamely denied allegations of delivery of unclaimed PVCs to APC candidates and politicians. We urge lovers of our democracy to join us in strongly rejecting the appointment and continuous retention of Mrs. Amina Zakari as head of Collation Centre of Presidential election in which her blood-relation is a candidate especially against the backdrop of her alleged inglorious conduct as head of election logistics at the shamefully rigged Osun governorship election rerun in favour of APC. We also call for an independent investigation into the alleged delivery of unclaimed PVCs by INEC to APC candidates and politicians. In view of the widely held belief that INEC is in romance with the failed ruling Buhari/APC government to rig the 2019 general elections and subvert the will of the people, we call on the international community to lend their voices and weight to pressure INEC to remain impartial and allow the Will of the people to prevail at the polls. We are gravely concerned that security agencies have become a department of the ruling APC, especially in view of their anti-people conducts at the elections of Edo, Ekiti, Osun, Kogi kwara and Katsina states as well as the widely condemned apparent romance of service chiefs with the ruling party, APC. We join our voices with that of well-meaning Nigerians and the international community to demand for the immediate overhaul of the security architecture of the armed forces and security services to restore the confidence of Nigerians and also urge the security agencies to resist the pressure of being used to subvert the will of the majority of the people at the 2019 polls. We also seize this occasion to restate that Nigerians who are the vested owners of our democracy for which great sacrifices have been made, are ready and determined to ensure that their votes count. While commending Mr Adamu Mohammed for his appointment as the Inspector General of Police, we urge the new IGP to be guided by his promise of neutrality, fairness and professionalism and to take immediate steps to erase the bad image foisted on the Nigerians Police force by the newly retired IGP whose tenure was ingloriously characterized by arbitrariness, framing-up of malicious charges against opposition politicians, illegal detention, corruption and partisanship of personnel on election duties. We are concerned about the politicized and partial anti-corruption fight whereby threats of arrest and prosecution are used to coerce opposition politicians to decamp to APC, the ruling party which is now a haven of corrupt politicians and decampees who are shielded or exempted from further prosecution. In the same vein, allies and associates of President Buhari like Abba Kyari, Babachir, Lawal, Isa Funtua etc have official cover for perpetration of corruption which curiously does not attract any investigation or prosecution despite public outcry. We urge Nigerians take the chance of the 2019 polls to vote out this government of deceit, falsehood and double-standard. We are concerned that Nigeria has been plunged into a brazen unprecedented level of nepotism, sectionalism, ethnicism and religious bigotry as a result of the parochially nepotistic policies and decisions of the Buhari/APC government. We urge Nigerians take the chance of the 2019 polls to vote out this government of ethnic disunity and religious intolerance. We urge Nigerian youths to shun violence and thuggery, ensure they collect their PVCs and mobilize to vote for ATIKU /Obi presidency to liberate Nigeria from the precipice of total collapse. We also thank millions of Nigerian youths who have been massively campaigning at the grassroots nationally for Atiku/Obi presidency and urge you all to continue in your efforts until victory at the 2019 general elections. 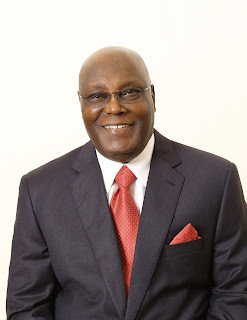 We use this medium to congratulate Atiku Abubakar for his trip to the United States of America in a big blow of shame to the naysayers and lie-mongers of APC whose stock in trade of lies and deceits has been further exposed. We particularly commend this policy-shaping and investment-seeking trip of His Excellency, Atiku Abubakar to USA as it further shows his efforts to be well-ready to hit the ground running after expected election victory at the 2019 polls and swearing in. We call on President Buhari to come out clear on his readiness to accept outcome of 2019 presidential election as exemplified by his predecessor, former President Goodluck Jonathan. We hereby urge Nigerians to be determined to resist any attempt by Buhari to truncate the will of the people at the polls. We are gravely concerned about the protracted killing of Nigerians by herdsmen, kidnappers, terrorists and various bandits bred by increasing insecurity, poverty, hunger and bad governance. We urge Nigerians to seize the opportunity of 2019 presidential elections to turn a new leaf to good governance, prosperity and improved security. We thank the Nigerian youths who have enthusiastically participated in our program to deliver 30 million voters for H. E. Atiku Abubakar. We are glad that by God's grace we shall hit the target at the 2019 presidential polls. We call on international community to be vigilant over the activities and tendencies of Independent National Electoral Commission, security Agencies and presidency especially in view of apparent desperation of the ruling Buhari/APC government to clinch to power by all means at all cost. Finally, let us reiterate that we are committed to a very peaceful, non-violent election. However, we are also determined and unreservedly committed to protecting our votes. In simple terms, we are ready and shall not allow any attempt by any persons or body of persons whatsoever, including but not limited to political parties and security agencies, to unduly influence, manipulate and /or rig the coming election as serious consequences await.